Sandy Williams reminds serious readers why Urban Fantasy is a genre to stick with. Her hot heroine McKenzie Lewis is a one of a kind shadow reader, tracking fae through fissures all while trying to earn a college degree. Caught in the middle of a war between the Court fae and rebels, McKenzie stands her ground with the nobles until rebel Aren gets into her head. 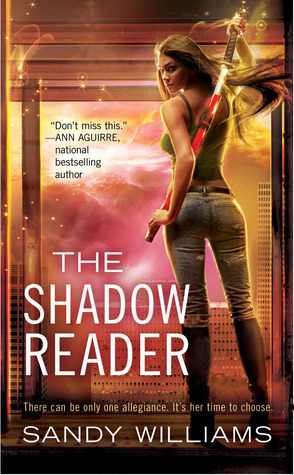 The Shadow Reader is one novel of which I can safely say that I loved each and every character. Even the evil ones were perfectly malicious! The first person narrative centers the focus of the novel on McKenzie, but there are about 12 characters moving the story along with their reoccurring roles or consistent presence. The many characters introduced aren't wasted in the story and it never feels like Williams spends incessant time describing them or trying to give them a brighter spotlight than they deserve. Williams is a smooth storyteller. She doesn't get caught up in too many action scenes or history of the fae. It's fortunate because I can only imagine how much history is certainly involved in the political aspect of the war between court fae and the rebels. As the story progresses Williams hands out pieces of information here and there, but even before the end of the plot all those pieces have completed the big picture. A big worry I usually have when it comes to fantasy novels is the names. I'm so glad to have been able to sail through The Shadow Reader with minimum issues with the fae names and language. Most of the words just roll right of the tongue and give the writing a romantic tone. I am one hundred percent committed to The Shadow Reader Series. I ache with excitement to see what happens to McKenzie now that the war has taken a sharp turn and loyalties have become an important factor to the fae. Book 2 in the series, The Shattered Dark, has big expectations to meet. Add THE SHADOW READER to Goodreads.